It’s happened to all of us at some point. You walk into the kitchen, or flip open your laptop, or stride confidently up to a lectern, filled with purpose?and suddenly haven’t the foggiest idea what you’re doing. Welcome to your idiot brain. Yes, it is an absolute marvel in some respects?the seat of our consciousness, the pinnacle (so far) of evolutionary progress and the engine of all human experience?but your brain is also messy, fallible and about 50,000 years out of date. We cling to superstitions, remember faces but not names, miss things sitting right in front of us and lie awake at night while our brains replay our greatest fears on an endless loop. Yet all of this, believe it or not, is the sign of a well-meaning brain doing its best to keep you alive and healthy. 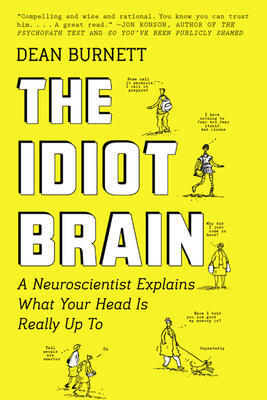 In The Idiot Brain, neuroscientist Dean Burnett celebrates blind spots, blackouts, insomnia and all the other downright laughable things our minds do to us, while also exposing the many mistakes we’ve made in our quest to understand how our brains actually work. Expertly researched and entertainingly written, this book is for everyone who has wondered why their brain appears to be sabotaging their life, and what on earth it is really up to. DEAN BURNETT, Ph.D., is a neuroscientist and a stand-up comedian. He is based at the Centre for Medical Education at Cardiff University. His widely praised Guardian science blog, Brain Flapping, has been viewed more than 16 million times in the last three years. Follow him on Twitter @garwboy.